Just over a week ago the site was updated and we see that these functions have now been added. Along with some tinkering to the site! I thought there was something different when I first logged into the site since the change! It took me a while to work it out! It’s more of a curiosity than anything. When you logged into the “old” site (using your Customer Portal log on) your avatar (if you had one in the Customer Portal) would display next to your name. However now no avatar! and added next to your name, your resellers name! (Handy in case you forgot who they were!) As I said, just a curiosity! Now for the exiting part. Access to the site from Mobile Devices. This was a must. Like many I’ll access the site at work via the desktop. I’m on the computer all day so it makes sense! However since I’ve had my Nexus 7 I very rarely use my Home Desktop! We’ve all discovered the joys of browsing reclined on the lounge! So I was interested to see if there were differences between the desktop and the Mobile devices. Having two different devices of different sizes (both a iPhone 4S(iOS) and the Nexus 7 (Android)) I set out to discover what were the differences! The Nexus 7 gave the best clue! The image on the Left shows the Nexus in Portrait mode and displays the MySw icon. 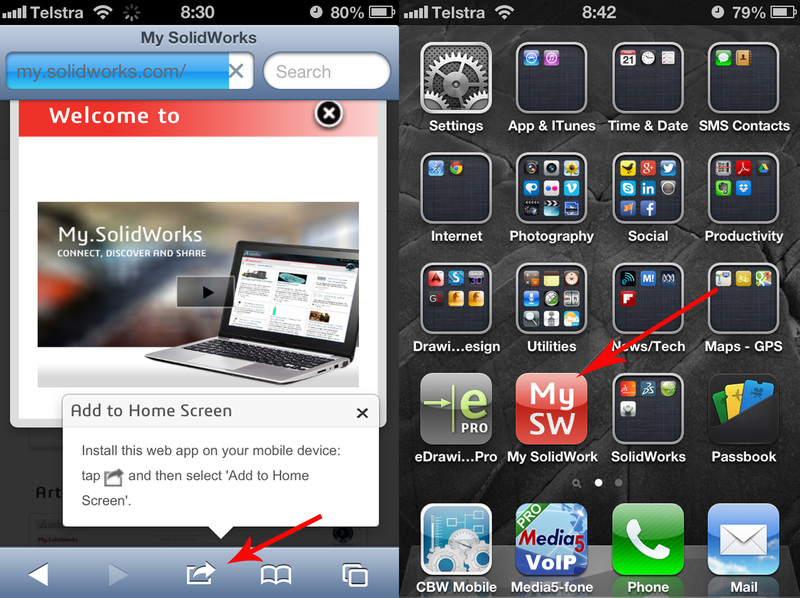 The image on the Right is in Landscape mode and shows the My.SolidWorks icon. At first I thought this was just another one of those curious things and kept myself entertained rotating between the two, just for my own amusement! However it appear it is the telltale sign of the different sizes and displays. In Portrait mode there is no Discussion/ Models column on the right. (more of that later) You have to scroll to the very bottom of the Featured column to locate the Discussions. On the iPhone it made no difference either in Portrait or Landscape mode. 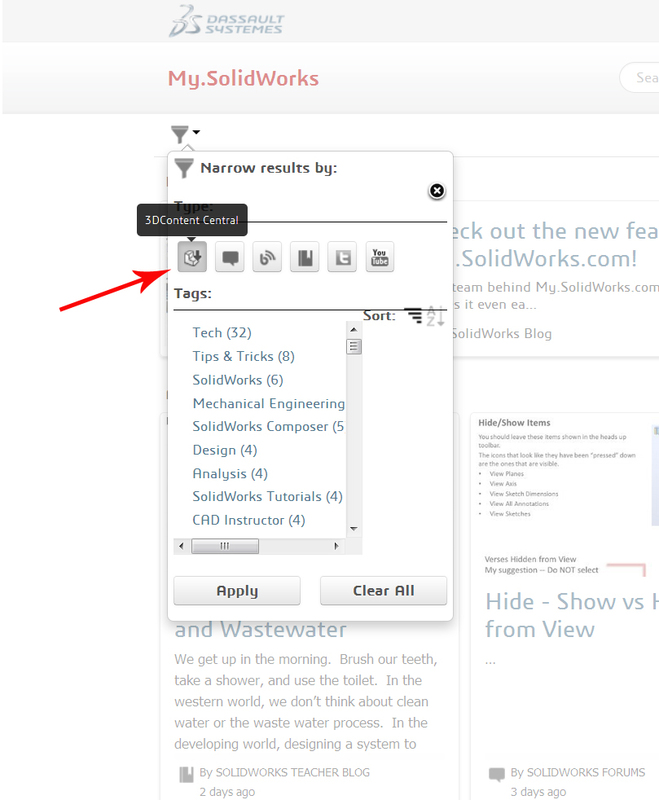 It always displayed the MySw icon and it always has the Discussion/ Model below the Feature. iOS also had a trick that I did not know about and had it (embarrassingly) pointed out to me! I’m going to put this down to always using Search in Safari, or selecting a link! I’ll also claim that I have never entered a web address direct into Safari! I now know that you can bookmark an Icon to (one) of the Home screens! Who would have known! Once you enter the web address and the site displays you can then select Sent to, then “Add to Home Screen”, which gives you the MySw icon on the Home Screen! 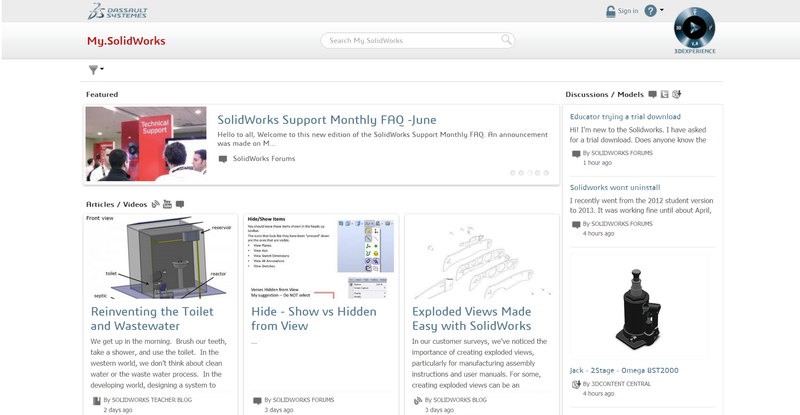 The Discussion column has now been renamed Discussion/ Model. This reflects the added content which is now brought in from 3D Content Central . 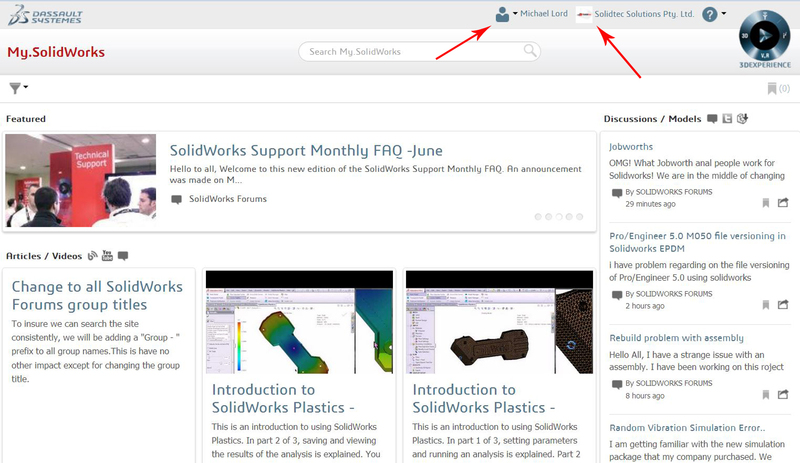 If you upload a model into 3D Content Central it will display (after around 30 minutes) in the Discussion / Model Column. Data from 3D Content Central appears to be limited at this stage. I’m only seeing a few models (listed for the past month!) when Filtering for 3D Content Central! Over the past few days I see only 4 or 5 models from that day (and another three or four sketches from a month ago) I would be supprised that only 4 or 5 models were uploaded to 3D Content Central a day! At this stage you appear not to be able to Search” for a Model. Having loaded both the above Jack and Reading Light I tried to Search using those tags (or my name). The search simply defaults to the blogs and other posts. As the models only appear to display for a day it makes it very limited! I guess Search may be added as the site develops but at this stage if you are looking for models then you are best to go straight to the 3D Content Central site. 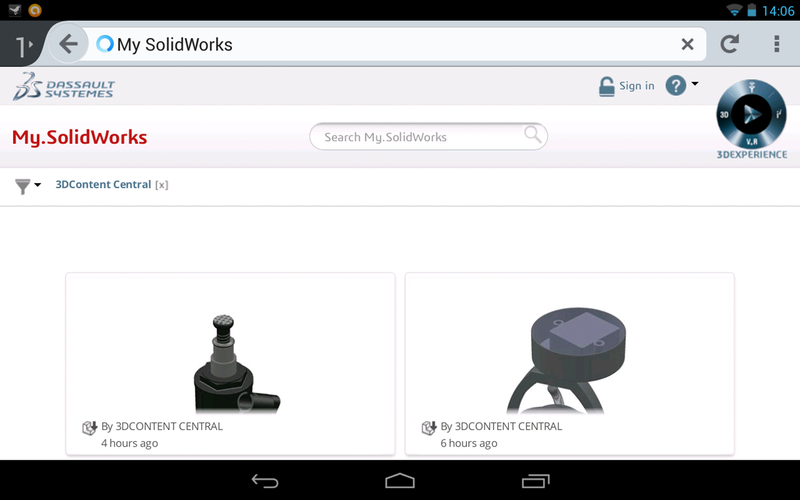 Well that’s the first of the updates to My.SolidWorks. Check them out for yourself! It nice that it is now accessible from my Nexus 7, I can now go back to reading reclined on the lounge!